Problems for anyone who lives in a low or wet area knows how common storm water and groundwater drainage problems are after a storm or periods of heavy rainfall. Improper outdoor drainage can lead to a number of headaches for homeowners: leaky or flooded basements, rain damage to foundations, soggy yards, and soil erosion issues. Koster Landscape Management Inc. offers complete outdoor drainage solutions to help you deal with these problems. 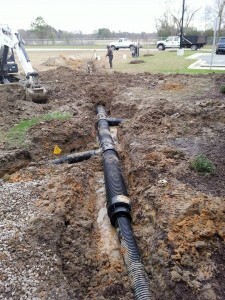 We can help you find the right drainage tool to divert excess water away from your home, including catch basins, trench drains, French drains, cisterns, rain gardens, and proper downspout drainpipe connections.